One of the best reasons to come to Granada is for the fantastic landscapes. Montefrio is one of these great locations. Of course the city of Granada is a great location for historic sites, gastronomy and atmosphere but the province also has its fair share of attractions too. Montefrio was selected by National Geographic as being one of the Best views in the world. 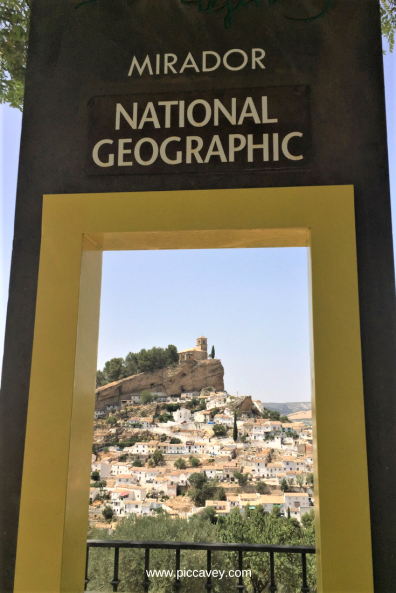 The Nat Geo selection of ten included this Granada town and one other Spanish town in Catalonia called Castellfolit de la Roca, which is situated in Girona province. 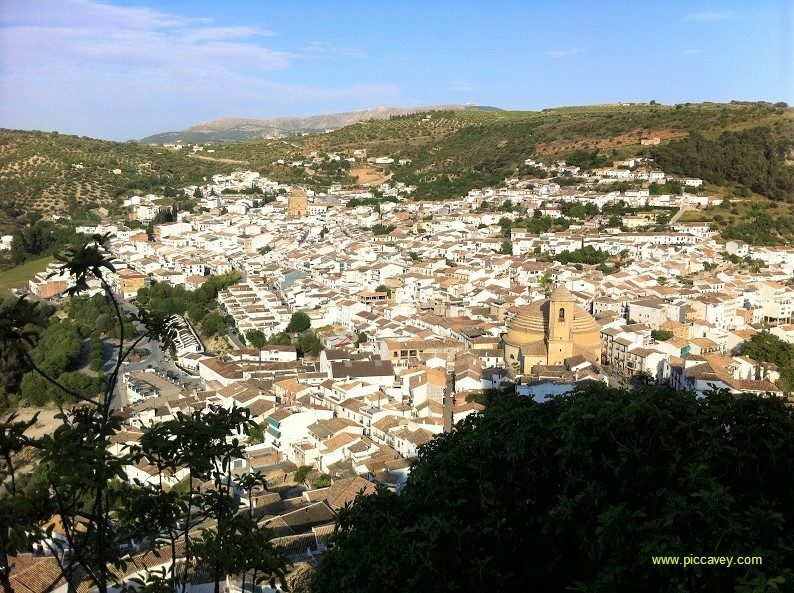 When you see the views in Montefrio it is easy to see why this unspoilt Andalusian white village came out top. Located to the east of Granada province Montefrio is a sleepy agricultural town with a spectacular skyline. 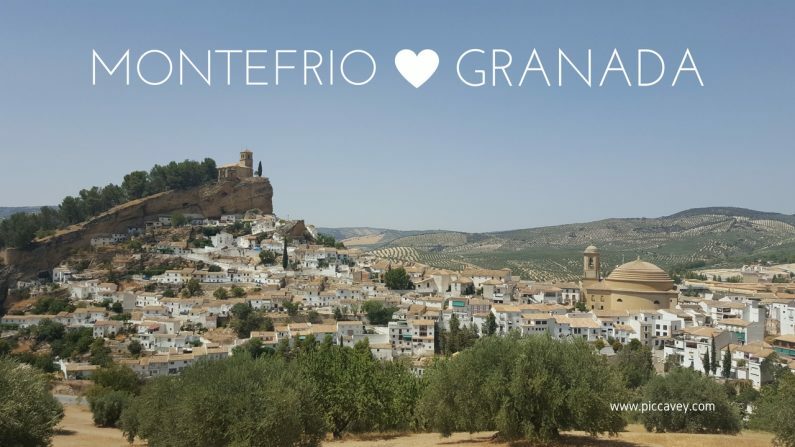 I have been to Montefrio and the Poniente Granadino área several times. Near to Loja and Riofrio this was the last frontier of the Kingdom of Granada at the time of Al Andalus. On one of my recent trips I captured this view in a short video below from the Mirador de National Geographic. Apart from this magnificient view there are also other things to see here. 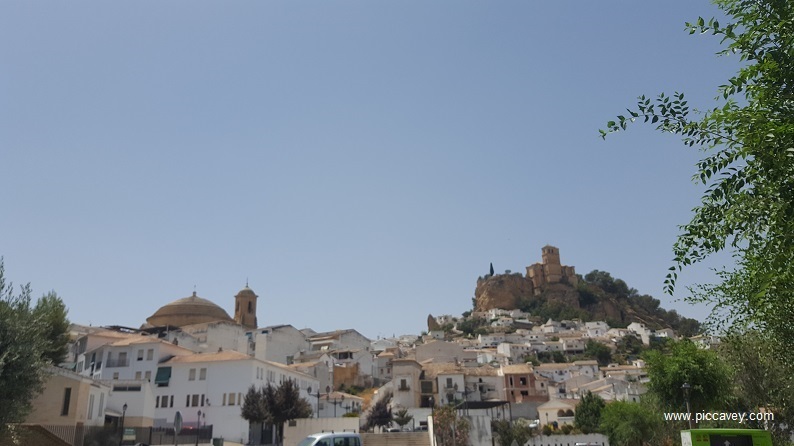 The main monuments in this rural andalusian town its two old churches. La Iglesia de la Vila and Iglesia de la Incarnacion. One is perched high above the town on a rocky cliff and the other is a round domed structure in the main town below. This is the view from the Iglesia de la Vila looking out across Montefrio and the round Encarnation church below. The Convento de San Antonio is also worth stopping off to see. The view outside is impressive as it has own mirador of Montefrio with another perspective of this photogenic place. 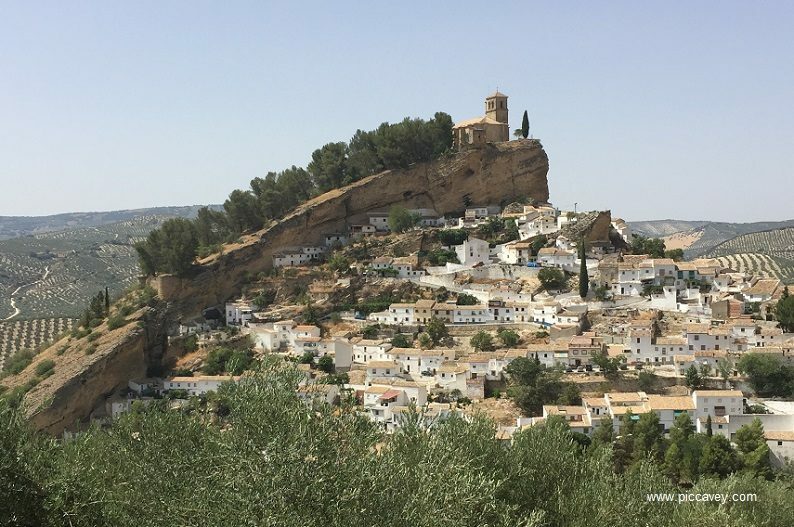 Just outside the town of Montefrio Las Peñas de los Gitanos in the surrounding countryside is a wonderful place to visit. Dotted with many Megalithic constructions and lush green landscapes overlooking Montefrio and the hills beyond. 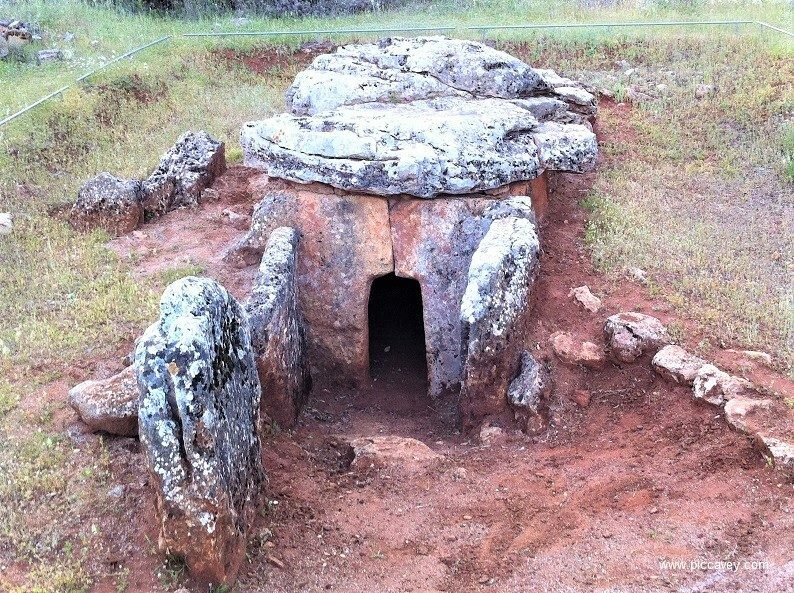 On a 6 square kilometres plot there are over 100 dolmens, a post Roman ruin and a Visigod necropolis. La Peña de los Gitanos is really is a great place for archaelogical fans to see. The visit takes around 2 and half hours and you need good footwear as the route is through fields and wooded areas. 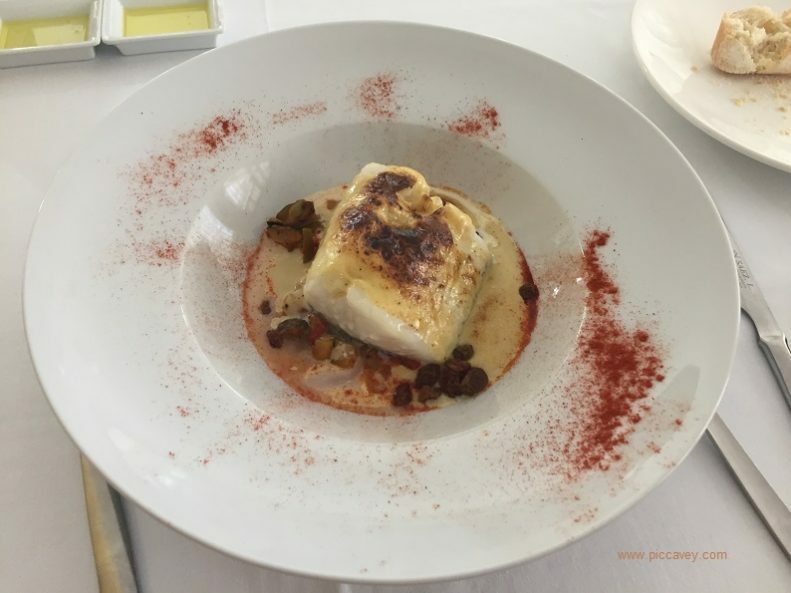 There are plenty of bars and cafés in the main part of town but to dine well head to the Flor del Olivo restaurant. Headed up by French Chef Jean Paul Vinay, this reknown chef worked at El Bulli some years ago with Ferran Adria. To welcome you into the restaurant you get to choose between 20 types of Extra Virgen Olive Oil from the region. As the name Flower of the Olive Tree suggests they are showcasing local food and EVOOs. For lunch on that hot Summer day I choose an ice cold salmorejo (tomato soup) and a fish dish. All the dishes we ate were presented well and delicious. Although the menu is not an endless selection, rather a carefully chosen list of what is on offer at time and good quality ingredients. 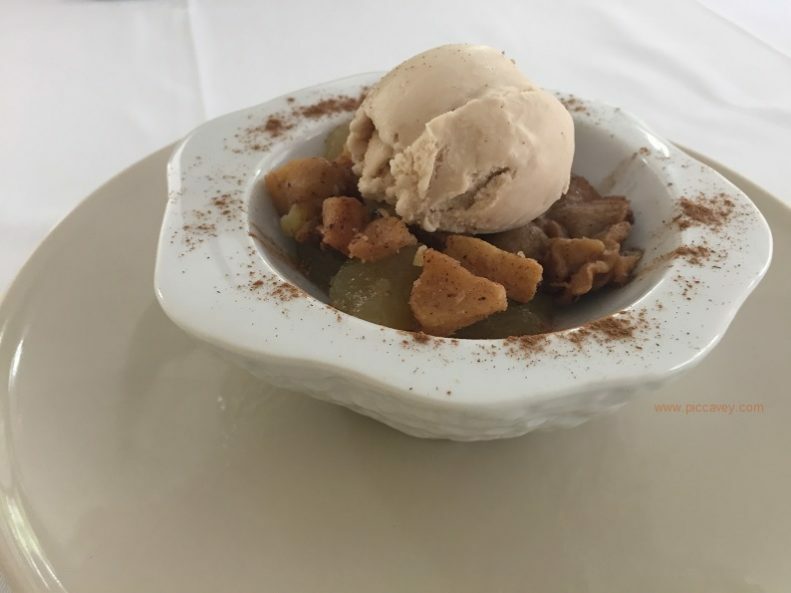 For dessert this baked apple offering was dusted with cinnamon and topped with home made ice cream. The perfect end to the meal. Wow! First time I heard of Montefrio. I’m absolutely impressed. Bucket list. I have visited “La Pena de los Gitanos” and nothing prepared me for what I experienced. It is not just for people who are interested in archeology. This is a small magical oasis charged with ancient history nestled in one of the most beautiful places in the world. THAT place was the highlight of my visit!! A must see!!!! It is great for people who love the countryside, hiking, history and amazing views. Quite difficult to explain in words. You need to see it for yourself. When I lived and raced bikes in Granada we would do training rides out to Montefrio and the surrounding area. It is truly idyllic and now I need to be sure and return to sample the gastronomic delights! Fiestas and people watching sitting outside the pregonero, casablanca, la Fonda or Chietos. Amongst other bars in the main square next to the round church. Have a small beer in each and get free tapas, no need to buy lunch. Also in summer the municipal pool, bar, restaurant is open. Nice big swimming pool. Great for cooling down with kids. Yes, Tapas are free across Granada province. The Iglesia de la Encarnación (round church) is the town centre and the best place to head for a tapas crawl. Flor del Olivo on Avda de la Paz is at the top of town and best to go by car. It´s a different experience for those wanting a sit down meal and Olive Oil samples of the region.